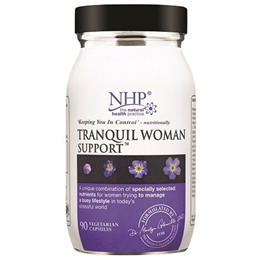 Natural Health Practice Tranquil Woman Support is there to keep you in control, nutritionally. This formulation includes a combination of specially selected nutrients for women trying to manage a busy lifestyle in today`s stressful world. 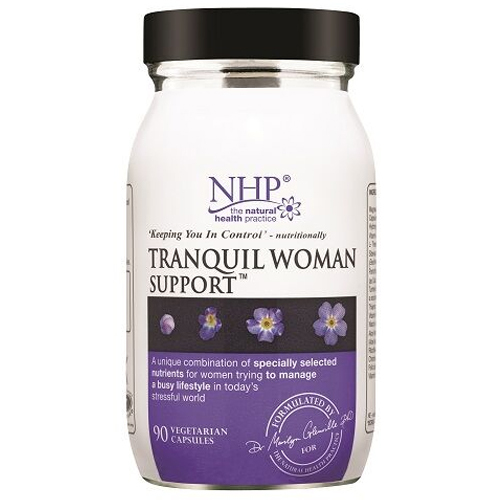 Tranquil Woman Support contains a combination of carefully chosen nutrients. It contains all the B vitamins, with extra B5 for the reduction of tiredness and fatigue, chromium for the maintenance of normal blood glucose levels, vitamin B12 which contributes to normal functioning of the nervous system and normal psychological function. Tranquil Woman Support also contains L-theanine to help you both physically and emotionally as well as Siberian ginseng, aloe vera and curcumin. Tranquil Woman Support is free from gluten, yeast and dairy products. It is made without the use of artificial flavours, colours or preservatives and is Kosher and approved by the Vegetarian Society. Magnesium (As Citrate), , Vitamin C (As Calcuium Ascorbate), L-Theanine, Siberian Ginseng Powder (Eleutherococcus Senticosus Root), Pantothenic Acid (As Calcium Pantothenate, Vitamin B5), Turmeric Powder (Curcuma Longa Root - A Source Of Curcuminoids), Thiamin (As Hydrochloride, Vitamin B1), Vitamin B6 (Pyridoxal-5-Phosphate), Niacin (As Nicotinamide, Vitamin B3), Aloe Vera Extract 200:1 (Aloe Barbadensis Inner Leaf), Riboflavim (Vitamin B2), Chromium (As Picolinate), Folic Acid (Folacin), Vitamin B12 (As Hydroxycobalamin), Capsule Shell: Hydroxypropyl methylcellulose. For best results take one capsule three times, daily with food. Below are reviews of Natural Health Practice Tranquil Woman - 90 Vegicaps by bodykind customers. If you have tried this product we'd love to hear what you think so please leave a review.